• Wheatgrass is a naturally occurring source of all minerals known to man and hosts a Plethora of Vitamins, is rich in protein, contains 17 amino acids and has up to 70% Chlorophyll. 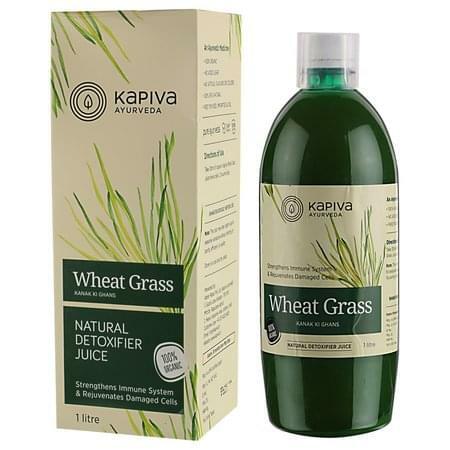 • Kapiva’s Wheat Grass Juice is made for anyone who wants to improve the general condition of their body. • Boosts nervous system, thereby ensuring that the body is well-managed. • Enhances capillary strength and reduces blood pressure. • Effective anti-ageing agent, controls greying hair and dandruff. • Improves functioning of the digestive system. • Gargling with it brings relief to a sore throat. • Cleanses the skin, purifies blood, kidneys, liver and the urinary tract. • Consume 30ml of this juice with 30ml of water twice a day to feel it’s positive impact on your body. • Kapiva derives its name from the three doshas of ayurveda – Kapha-Pitta-Vatta. our range of 200+ GMP Certified products have the right herbs in the right dosage and provide solutions to a variety of ailments. It's the day and age of hybrids, so go ahead and enjoy the best of both worlds - Ayurvedic tradition + Modern-day science and technology.